As one of the world's most recognized buildings, Tower Bridge symbolizes London for many. Now you can build your very own version using Ravensburger’s innovative 3D puzzle technology, featuring high quality hinged plastic pieces. Either assemble it using the stonework guide or by the numbers printed on the reverse side of each piece. Put the pieces together in sequence and see Britain's most famous bridge appear before your eyes. Build the 2 main towers using puzzle pieces and the rest of the structure using the high quality plastic segments provided. The finished building measures over 1 meter or 39 inches long. 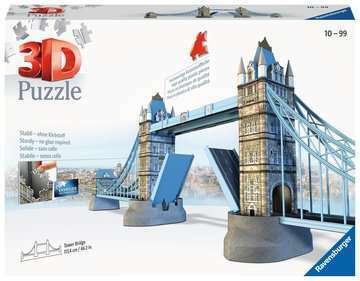 Whether as a fun, new challenge for yourself or for anyone interested in architecture, model construction or tourism, this beautiful memento of London appeals to even the most traditional of puzzlers and makes for a great decoration when completed. 216 piece plastic 3D shaped jigsaw puzzle with plastic trimmings and detail. 13" x 46" x 7"